On Saturday afternoon the New York Yankees dropped the second game of a three game series to the Boston Red Sox at Fenway Park 10-1 the day after the Bombers had come back from a five-run deficit. The upset put the Yankees five and a half games back in the American League Eastern Division and left them just three games up on the Detroit Tigers in the AL wild-card. The game included a match-up between two starting pitchers, Chien-Ming Wang and Josh Beckett, who each entered the game with 18 wins apiece and were both considered to be front runners for the AL Cy Young award. In the first inning, while the sell-out crowd was still expecting to see a pitchers duel, Derek Jeter broke it open with one out in the first inning when he pounded the ball over the center field wall to put the Yanks in front 1-0. During the bottom of the first the Red Sox quickly answered back as Wang allowed three singles, the final one being an RBI single off the bat of third baseman Mike Lowell to tie the game 1-1. The RBI was number 105 of the season for Lowell which tied a career high for him. The game remained tied going into the bottom half of the fifth inning until JD Drew drove in Jacoby Ellsbury with a two-out RBI single to put the Sox up 2-1. Ellsbury had pinch-run for Kevin Youkilis who was removed from the game after being hit on the right forearm by Wang earlier in the inning. Eric Hinske doubled to leadoff the bottom of the sixth and was followed by a single off the bat of Coco Crisp. Two batters later, Dustin Pedroia hit a ground ball which was thrown home in an attempt to get Hinske at the plate. 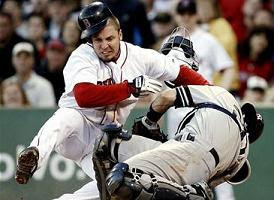 Hinske then collided with catcher Jorge Posada who had blocked the plate. Posada was dazed after taking the hit but he hung on to the ball throughout the play and Hinske was called out. The Yankees’ luck would not last as the next batter, Ellsbury, hit a single to left field which caused Crisp to score and put the Sox up 3-1. David Ortiz then knocked Wang out of the game with a two-RBI double scoring Pedroia and Ellsbury and put Boston out in front 5-1. Wang lasted only 5 2/3 innings and left the game trailing 5 to 1. Despite Wang’s early exit Beckett was holding up his end of the pitchers duel. He had retired 12 batters in a row before hitting Jason Giambi in the top of the seventh possibly in retaliation for Youkilis. The Yanks failed to capitalize though after Robinson Cano followed by singling to center to put runners on first and third when Melky Cabrera struck-out swinging to end the inning. With the Yankees on the ropes the Red Sox tacked on a few more insurance runs to prevent a comeback. The Yanks used five relief pitchers in the bottom of the seventh: Edwar Ramirez, Ron Villone, Brian Bruney, Sean Henn, and Ross Ohlendorf. Combined they allowed four runs on two hits and five walks during the seventh which put the Sox ahead 9-1. The biggest blow came with Henn facing Ellsbury with the bases loaded who then singled to drive in Hinske and Crisp. Ellsbury scored two runs and drove in three during the day despite not being in the opening lineup. Beckett wound up improving his record to 19-6 after pitching seven innings, allowing only three hits, a single run, all while striking-out seven. Wang got the loss and now has a 18-7 record falling behind Beckett for the league lead in victories.